This colorful Chaunax stole the show for me. 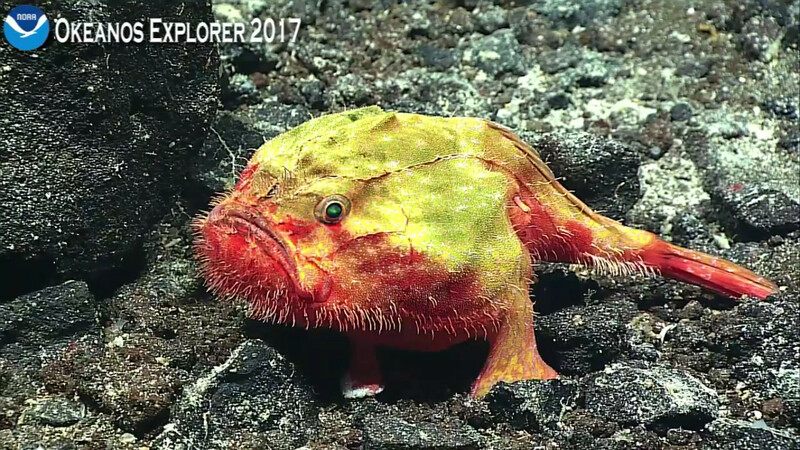 This diverse lophiiform genus is only found in deep habitats and goes by several common names: “sea toads” “coffinfish” “frogmouth”. 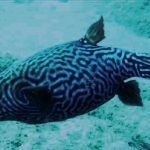 They’re relatives of the familiar reef-associated anglerfishes in the Antennariidae, but the lure in this group is much shorter and is said to be bioluminescent. And here we have a hermit crab that has an obligate symbiosis with a species of zoantharian known as Epizoanthus. I wrote about this a while back, but this particular species appears quite different from other images I’ve seen. 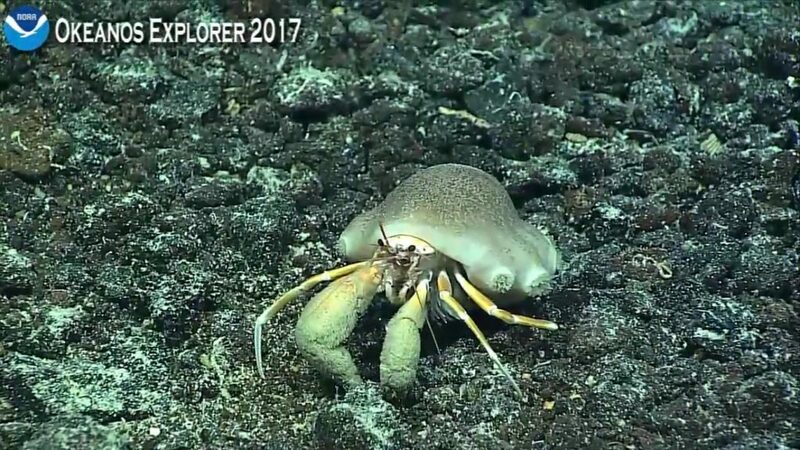 Several of these crabs were seen at the very beginning of the dive in a flat, rubble-filled plain at a depth of around 500 meters. This is a False Moray Eel, a small group of small, deepwater eels that is classified in its own family, Chlopsidae. 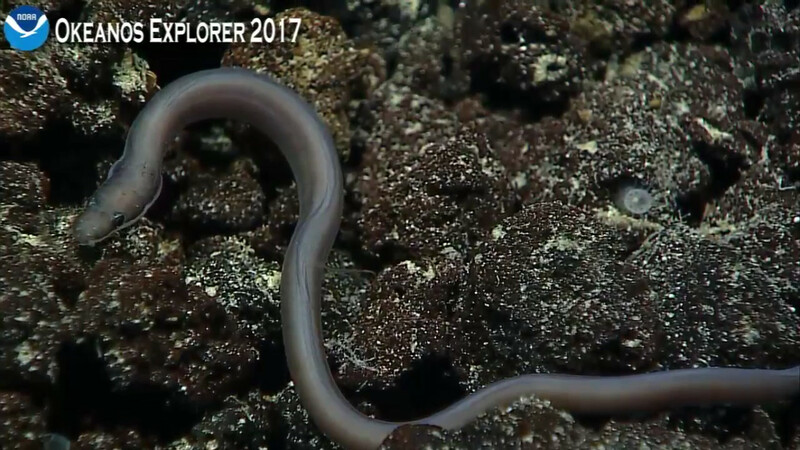 This specimen leisurely poked about its basaltic surroundings in search or the invertebrates that make up its diet. Though it’s hard to tell the size from this photo, the specimen was probably well under a foot in total length. 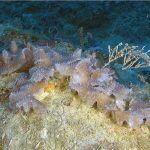 This elegant azooxanthellate coral is probably a species of Caryophyllia (or perhaps a related genus). Several of these dotted the landscape in a region exposed to fairly strong currents. 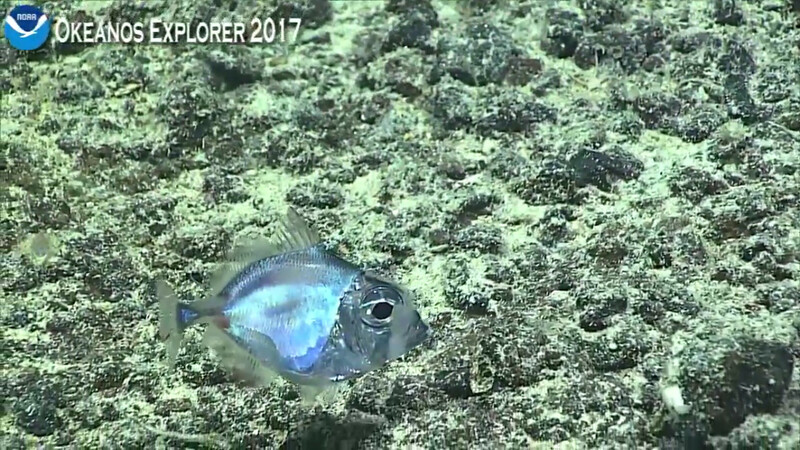 While I would love to have a reef tank full of these, the temperature in its habitat was a nippy 9°C. This is a Lanternbelly in the genus Synagrops. 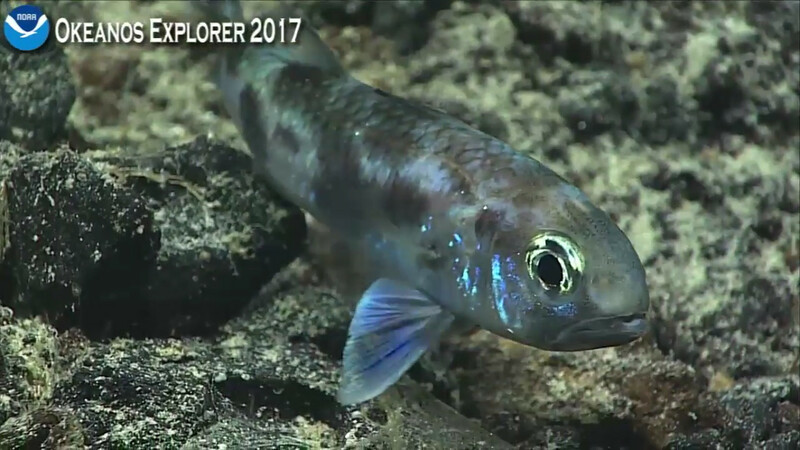 It belongs to a small, little-known family of deep sea fishes, the Acropomatidae, that have bioluminescent photophores along their belly. This is Cyttomimus, known as the False Dory. Very few images exist of this group, so this was an exciting find. It’s related to the true Dories (not the false Dory of PIXAR fame! ), but is placed in a different family. 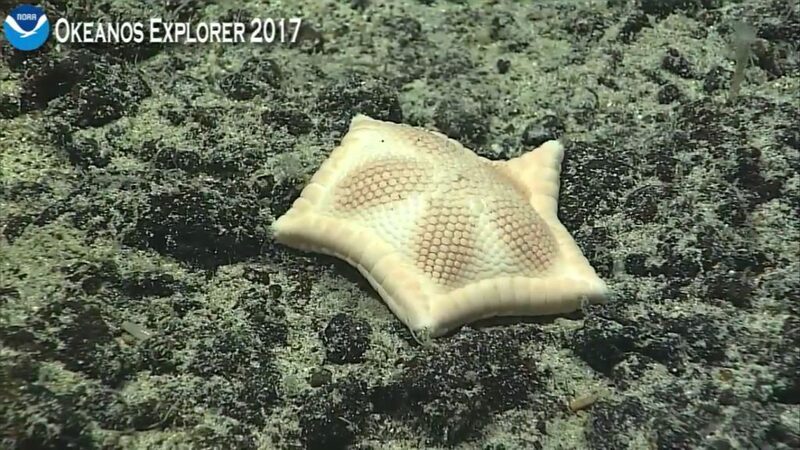 This sea star looks suspiciously like a tea biscuit and is likely in the genus Ceramaster. 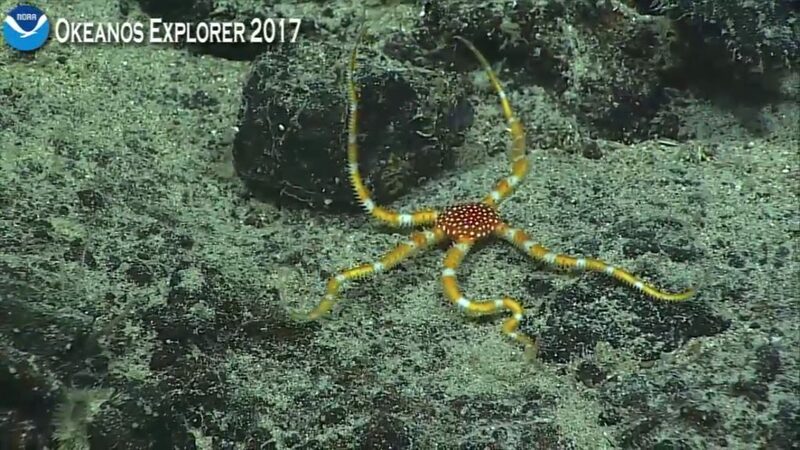 Christopher Mah, noted authority on sea stars, mentioned that this particular family is quite ancient and would have been at home on a Cretaceous reef. 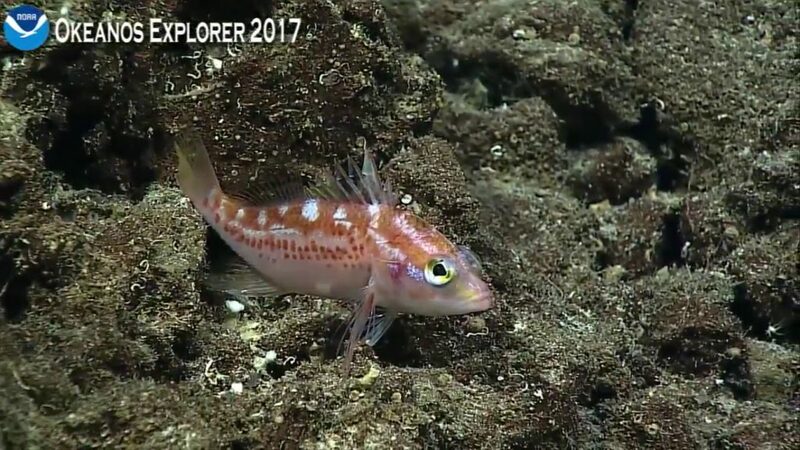 This secretive fellow showed up a couple times on the dive and appears to be a basslet of some sort. 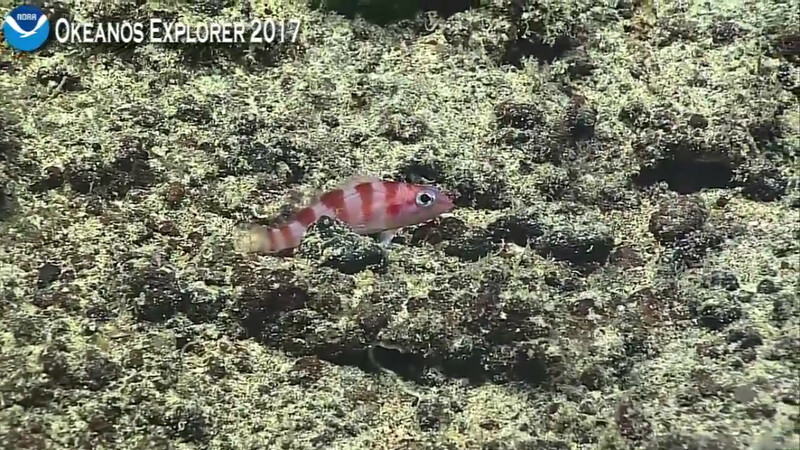 It might belong in the huge, polyphyletic mass of species known as Plectranthias, though its a bit more elongate in shape than most of those. This is a cidaroid sea urchin, an ancient group that seldom makes its way into aquarium exports. 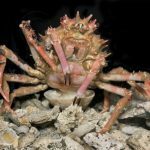 This interesting species was found to be associated with a spider crab (Majidae) on a couple occasions. But, why? 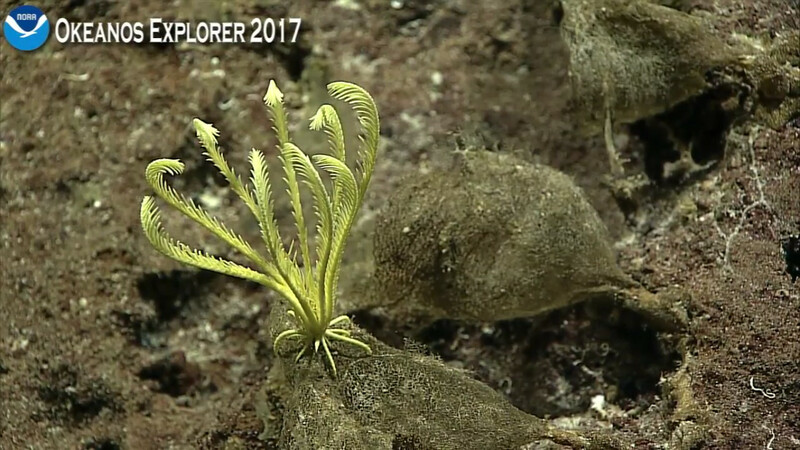 There were many crinoids on this dive, as tends to be the case when Okeanos touches down to the briny deep, but this simple yellow comatulid was my favorite of the bunch. 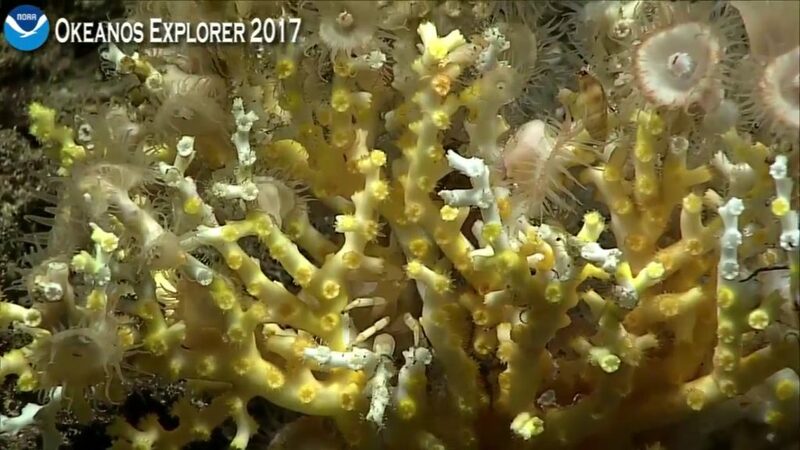 This is Anthomastus, a soft coral found only in deeper waters. 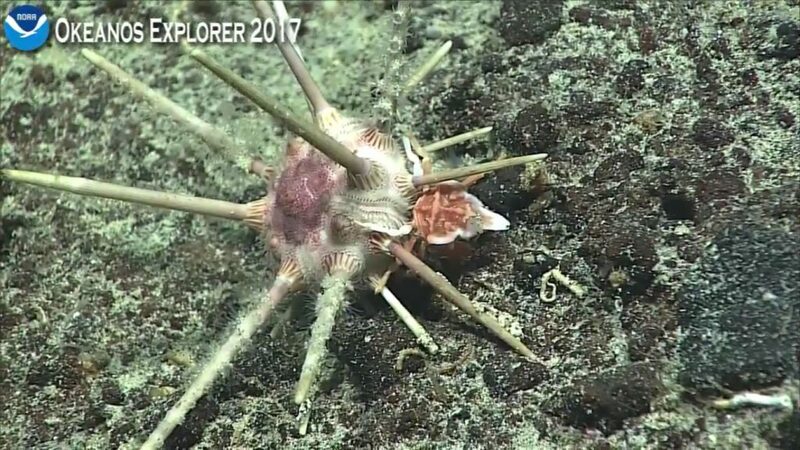 If you watched the live feed, you got to enjoy an awkward robotic arm attempt to collect one of these for what seemed like hours. 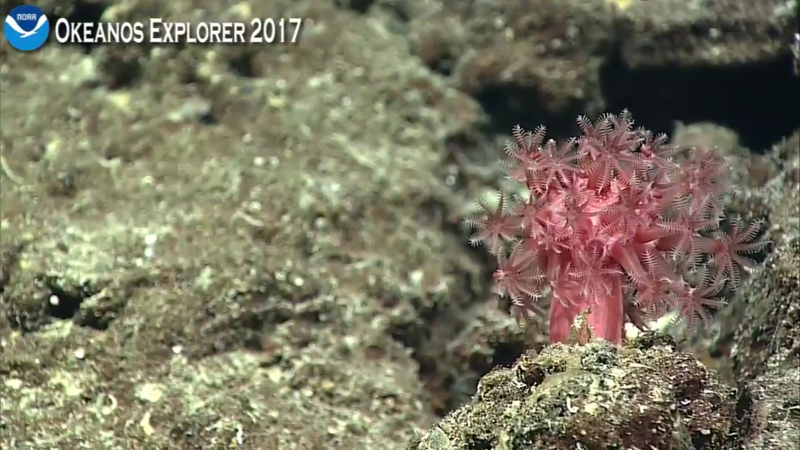 This is (probably) Enallopsammia, a deepwater relative of the sun coral (Tubastraea). 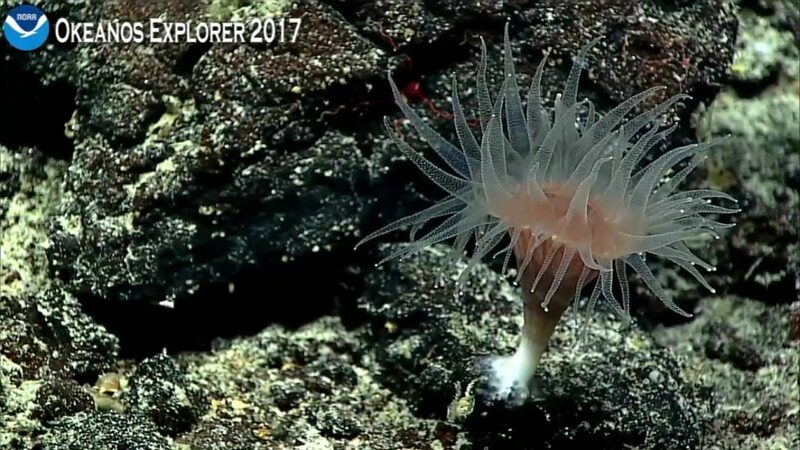 There are also quite a few zoantharians perched atop the exposed skeleton, and a crab of some sort in the middle, illustrating just how diverse the deep sea can get. 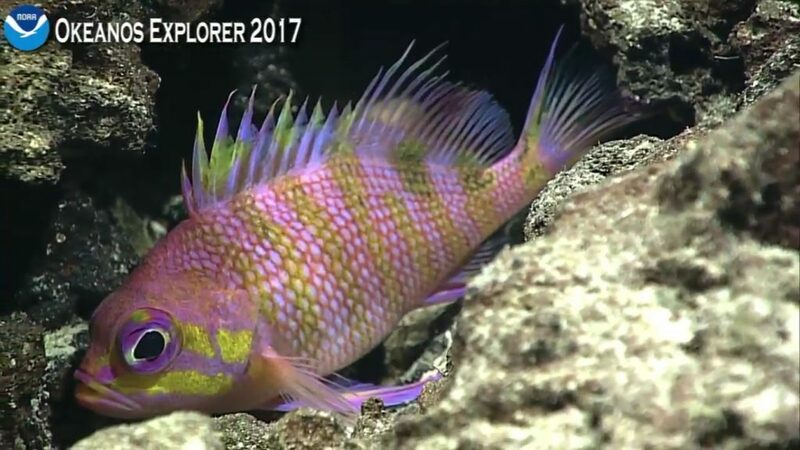 This stunning Odontanthias only made one brief appearance before swimming off into the distance. 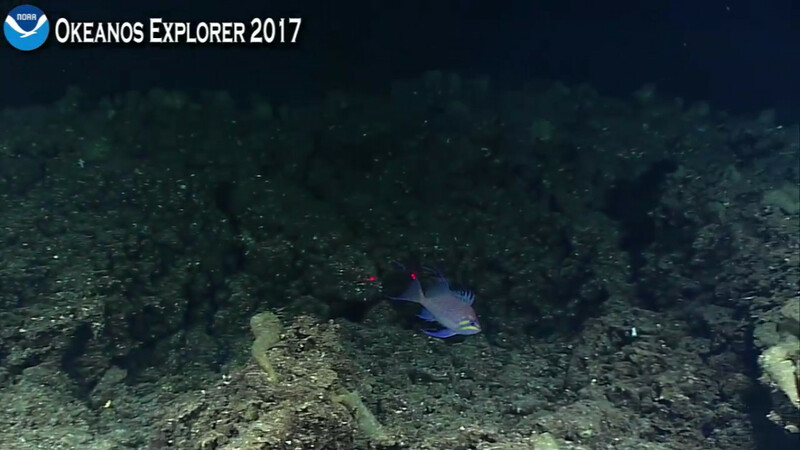 Dear Okeanos crew, when you see a deepwater anthias, maybe zoom in on it first before focusing all your attention on the stationary rocks and sponges that seem to interest you so much… because, ya know, those don’t briskly swim away from submersibles. Just a thought. 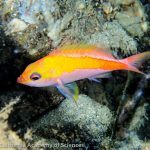 This colorful undescribed species should look familiar to those who followed along on the Mariana Islands expedition. 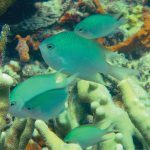 It’s been tentatively identified as belonging to the genus Dactylanthias due to the the unusual caudal fin shape and relatively large scales.